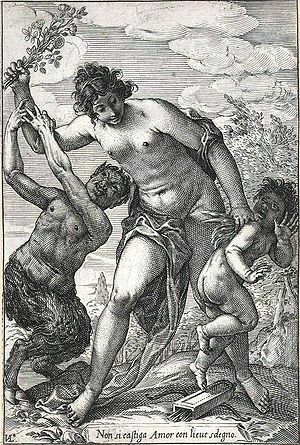 Cupid Punished by Venus, engraving by Giovanni Luigi Valesio, 17th century. Engraving is an intaglio method of printmaking in which the image is gouged with a sharp tool into a metal plate. Printing the plate is done by covering the surface with ink, then rubbing the ink off the surface with tarlatan cloth or newsprint, leaving ink in the roughened areas and lines. Damp paper is placed on the plate, and both are run through a printing press; the pressure forces the paper into contact with the ink, transferring the image. Note that the printed image is always a mirrored image of the original plate. This page uses content from Wikipedia. The original article was at Engraving. The list of authors can be seen in the page history. As with Spanking Art, the text of Wikipedia is available under a copyleft license, the Creative Commons Attribution Sharealike license. This page was last edited on 21 May 2006, at 11:57.